Batteries are really what Tesla is all about — not the media-loving, mass market Model 3, not Roadsters, not falcon-wing doors, and certainly not the hyperloop. Batteries are the keys to completing a worldwide transition to a clean energy economy, and Tesla, with all its entrés to date into increased battery storage capacity, will really have to step up its game to dominate the market share as CEO Elon Musk has publicly envisioned. During Tesla’s recent Q4 2017 conference call, following the release of the February 7th shareholder letter, CEO Elon Musk said that the company “put a lot of attention on other things and just got too comfortable with our ability to do battery modules because we’ve been doing that since the start of the company.” Overlooking the importance of batteries is a significant strategic error, and one which Tesla needs to quickly and efficiently remedy. Tesla is experiencing a tremendous learning curve as it produces the essential batteries to power clean technology of various kinds. Employees involved in battery production told CNBC that the company was assembling batteries by hand as recently as December 2017. At the time, they were skeptical that Tesla could accomplish its revised goals and manufacture 5,000 Model 3s per week by June 2018. Deepak Ahuja, Tesla CFO, added during the conference call that in addition to the Model 3, the company needs to focus on “our infrastructure spend: superchargers, stores, service centers. We want to significantly increase the service capacity; we want to significantly increase our supercharging capacity.” Supercharging is imperative until such a time when batteries can hold enough charge to make recharging a good rather than essential decision when all-electric vehicles are on the road. But it’s all about the batteries, stupid. USA Today reported that Musk blamed the company’s underwhelming Model 3 production partially on an unidentified supplier that failed to live up to expectations, causing insufficient production of the critical lithium-ion batteries made at Tesla’s Reno, Nevada factory. “It’s our fault for picking the wrong supplier and then not realizing it until way later in the game,” Musk told investors in November. 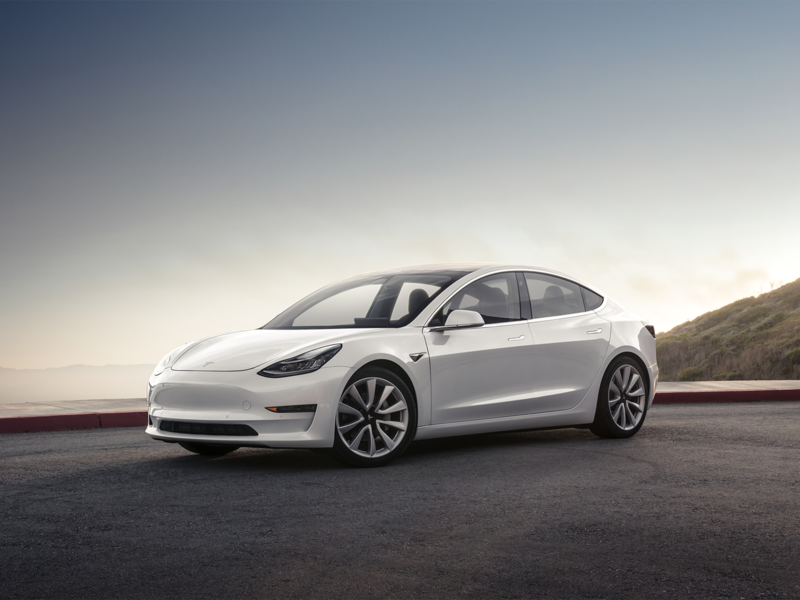 The molasses-like production of Model 3 electric cars was trickier than anticipated due to battery module assembly difficulties. An individual cell is the fundamental building block of a battery, and each is fewer than 3 inches long and smaller than 1 inch in diameter. As the battery charges, positively charged lithium ions move from the cathode to the anode through an electrolyte solution in the battery cell. The electrons gather on the anode, at the negative side, and the reverse takes place when the battery is discharged. The electrons move through external circuits that can provide power to thousands of homes, businesses, or electric vehicles. The degree to which the general public embraces all-electric transportation is contingent upon those batteries: how much energy storage a vehicle possesses — as well as whether the vehicle/ fleet owner can generate enough energy in a private storage system. That returns us to the battery dilemma. Why are Batteries Integral to Clean, Renewable Energy? Tesla’s home battery integrates with solar to harness the abundant power of sunshine falling on rooftops and reduce reliance on fossil fuels. Renewable energy sources like the wind and the sun often have excess energy that, unless stored, can “go to waste.” Batteries are the most common type of energy storage and can collect and store excess electricity for those times when clouds, calm days, or the night sky interrupt renewable energy generation. Batteries may also slowly change the dynamic among energy utilities, homeowners, and businesses as batteries at residences, offices, and other commercial buildings allow customers to save electricity collected by their solar panels to use at times when electricity prices are highest. 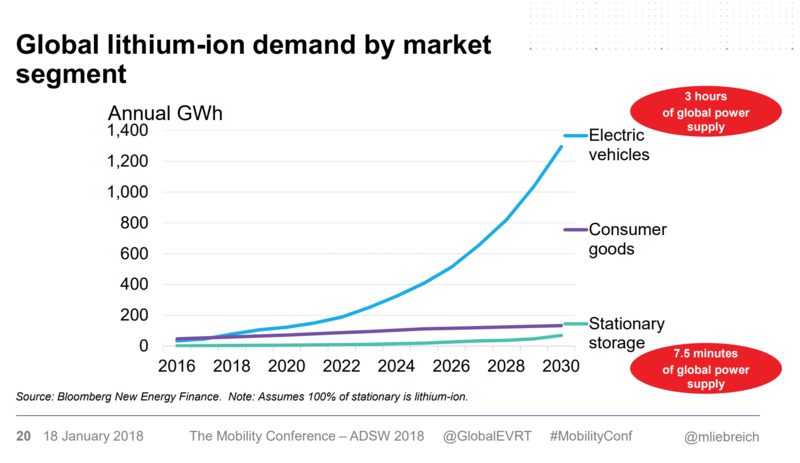 In a recent presentation at The Mobility Conference, co-organized by CleanTechnica, Bloomberg New Energy Finance founder Michael Liebreich also highlighted how much potential electric vehicles will offer for storing excess electricity and balancing the grid. The video and key graph are embedded below. Tesla reported Q4 2017 financial results that highlighted the rapid decline in solar installations. Tesla’s energy generation and storage revenue in the 4th quarter was $317.5 million, a 6% decline from the previous quarter. The company reported solar system installations totalling 87 MW, a 20% decline from the previous quarter, which had seen a decline of 38% from the second quarter of 2017. The overall decline in installations through 2017 was 42%. Let’s look at the Tesla/ South Australia energy partnership as a microcosm of what Tesla would like one day to accomplish on a global scale. South Australia has the world’s biggest battery installation, made up of network of batteries housed in Tesla-made units called Powerpacks. Each Tesla Powerpack has 16 layers of batteries inside, and those battery pods contain cells. These battery cells (2170 cells), produced in Tesla’s Nevada Gigafactory, are used in utility-scale usage, homes, and the Model 3. 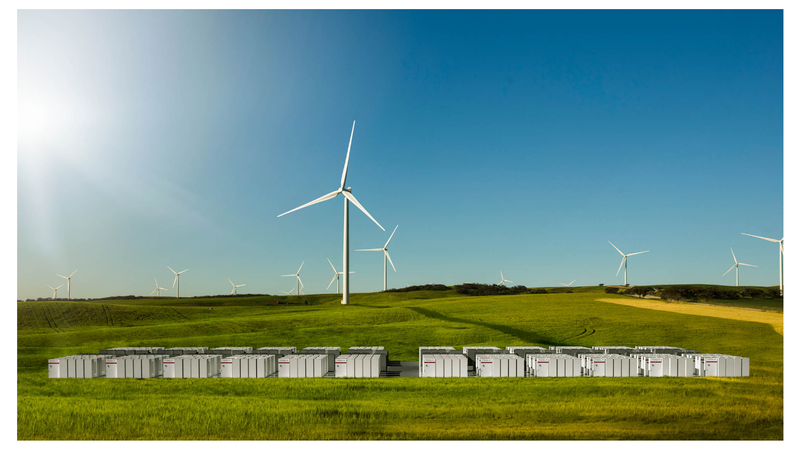 The South Australia Tesla Powerpacks charge using renewable energy from the Hornsdale Wind Farm. They serve as an electricity reservoir for times when power demand peaks, a large fossil power plant goes down, or the wind isn’t blowing. Able to help maintain the reliable operation of South Australia’s electrical infrastructure with 100 megawatts of power capable of energizing over 30,000 homes, Tesla is helping to transform the state’s movement towards renewable energy and see an advancement of a resilient and modern grid. As an example of its potential, the 100MW/129MWh Hornsdale Energy Reserve intervened in just 140 milliseconds when Victoria’s Loy Yant power plant failed. And the clean energy news out of South Australia keeps getting better, including a “virtual power plant” that will tap Tesla energy storage installations across tens of thousands of homes. Tesla is also poised to drastically expand sales of large energy-storage facilities in other regions. It’s all part of the company’s plan to help “achieve a sustainable energy economy,” and batteries are a — or the — critical component. Let’s pose one final question about Tesla policies and battery production. What might the effect of the recent exodus of battery tech leaders like Celina Mikolajcza and Ernest Villanueva have on Tesla? Mikolajczak served as Tesla’s senior manager and technical lead for battery technology, cell quality, and materials analysis. Liaison to Tesla’s suppliers, Mikolajczak tested the car company’s lithium-ion batteries for long-term use, oversaw quality assurance, and conducted failure analysis to drive battery cell production and design improvements. Villanueva, who holds numerous patents, was integral to the design process of battery modules that power Tesla’s vehicles. With a Tesla resume that stretches back to 2006, Villanueva has watched Tesla grow from an idea to an all-electric vehicle and renewable energy storage company. What part must battery production play in order for that movement away from a “mine-and-burn hydrocarbon economy” to come about across the globe? How much will the battery market grow in the next few years? Will lithium-ion batteries continue to be the primary method of storing electricity? Will the cost of lithium-ion batteries continue to fall and assure the market’s continued growth? Assuming the answers are all strong, it seems that Tesla’s best move would be to put all of the effort it can into leading on batteries and not getting complacent with what it has achieved so far.